Iglesia La Esperanza in Valrico, Fla. (Jesus Munoz, pastor), is bursting at the seams! They’ve outgrown their meeting space and need to find new facilities. Elk Creek Church, a Grace Brethren church in West Grove, Pa., recently celebrated their first anniversary. Pastor Mike Silliman has seen God at work in the church through changed lives and salvaged marriages. Native New Life Church, a Grace Brethren church in Albuquerque, N.M. (Arnold Betoney, pastor), recently purchased a building. It will be an important point in the community as the congregation reaches out to touch lives with the Gospel. 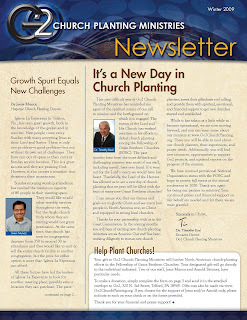 These stories and others are included in the Winter 2009 issue of the Go2 Church Planting Ministries newsletter, which was mailed in late December. A copy may be obtained at a local Grace Brethren church or send your mailing address to Go2 Church Planting Ministries, info@Go2ChurchPlanting.org, or by calling 877-222-2048. It’s a new day in church planting!